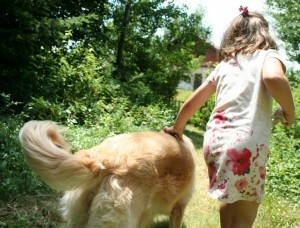 The loss of a beloved pet may be the first death experience children face. It is very traumatic for the child and should not be trivialized. Their feelings and emotions are very real and they are trying to process the situation as best they can. They need the support and understanding of caring adults to work through what has happened and what it means to them personally. Pet loss and the surrounding activity can be a catalyst for growth and understanding with the whole family. Talking and sharing thoughts and emotions is one of the best ways to cope. That is why people gather after a funeral to share stories and acknowledge the part the deceased has had in their lives. It is a teaching moment to share openly about what is going on in our hearts, minds and bodies. Recognize that not all children or adults grieve the same way. So, do not expect the child to be openly sad or to be appearing uncaring in their attitude about the death of their pet. It may take some time to process what this loss means to them. No matter how the child may appear to be taking the news, do have a period of time just for them to talk and you to listen. After sharing their fears or concerns, you will want to reassure them that they are safe and loved. This may be the opportunity to teach the values and beliefs that you may not have shared with your family. A great many people who deal with depression or feelings of suicide as adults suffer from some sort of sorrow they never had the opportunity to work out as a child. If you or your child is having difficulty processing this and other traumatic situations in life, please consider my private coaching. You will want to claim your free session at http://www.JudyHWright.com to see if what I can offer resonates with you. You will always be glad you did.